Only time will provide the definite answer. You will recall that it was a week ago that we took Hazel to see a specialist and I posted Hazel’s Probable Disease. That evening our vet friend, Jim, brought over a supply of Prednisone tablets with the instructions to stop the Fluconazole treatment and switch to Prednisone. We started at a dosage of one 20mg tablet every 12 hours. 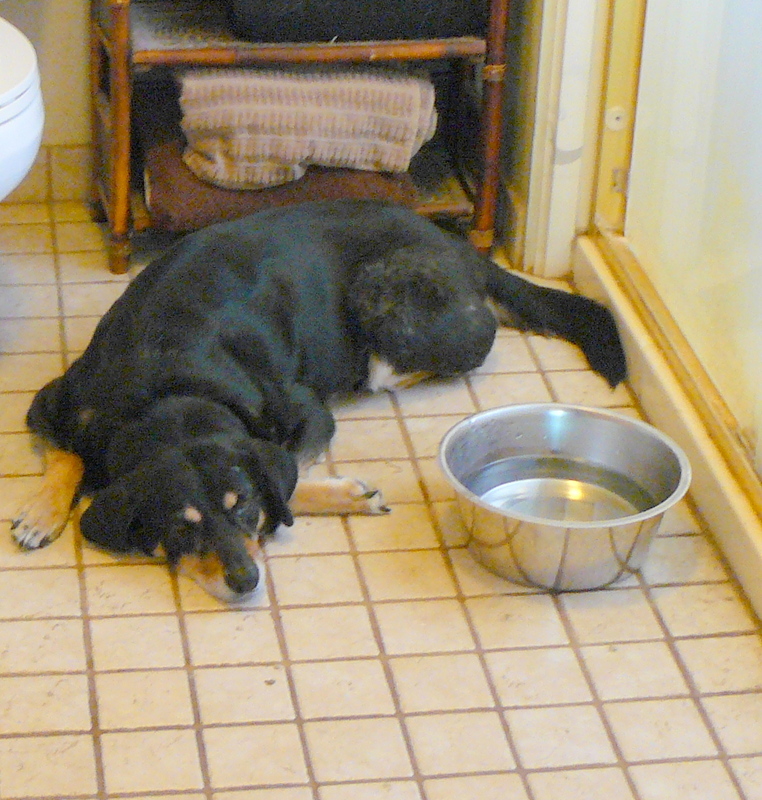 Hazel enjoying the cool floor of our bathroom yesterday afternoon. Within twenty-four hours the Prednisone had stimulated a return of Hazel’s appetite and for the last seven days she has been eating very well. Plus she has regained an interest in the world around her and now comes out for walks with the other dogs. Jim and I went for a short hike yesterday afternoon and we were discussing Hazel. Jim reminded me that while the lung pictures and the other evidence were pointing to it being cancer the actual tumour still hadn’t been found. If there is no noticeable decline in, say, three or four weeks then it may not be cancer. Certainly, Jim said, if it is cancer then Hazel will not live out another three months. Time will give us the answer. At least she has regained her appetite (maybe I should try Prednisone) and is going for walks. Sounds like it’s a day at a time. Big hugs beautiful girl. Absolutely! One day at a time! Only thing with corticosteroids is you have to control her diet [no salt / sugar] and as she may be retaining fluids, she’ll be needing more visits… to the loo! Sending my very best wishes and a huge hug to her. But don’t forget to keep one hug for yourself! My heart and fingers are crossed for all of you. Keeping all of you in my prayers…..
Barb, your prayers are precious. Thank you. A beautiful little girl and I hope she gets better soon. Sending healing love to her in my prayers and hugs. Karen, yes Hazel is a most beautiful girl. Likewise, your prayers are so precious. Yes, doesn’t it just! Fingers tightly crossed for the coming few weeks. Thank you, Val. Elizabeth, you are so sweet, as is everyone else. Big hugs from this end, and tail wags from Hazel. So happy to hear she’s feeling better. You’re right time will tell, but at least she’s back to enjoying herself. Thinking of you all. Hoping for the best. Tricia, in a very real way it’s another lesson from our dogs. That all of us need to place living in the present at the top of our priorities. Thank you so much. Bela, you imagine correctly. Yet it would be so much more difficult were it not for the compassion shown by you and so many others. Thank you.